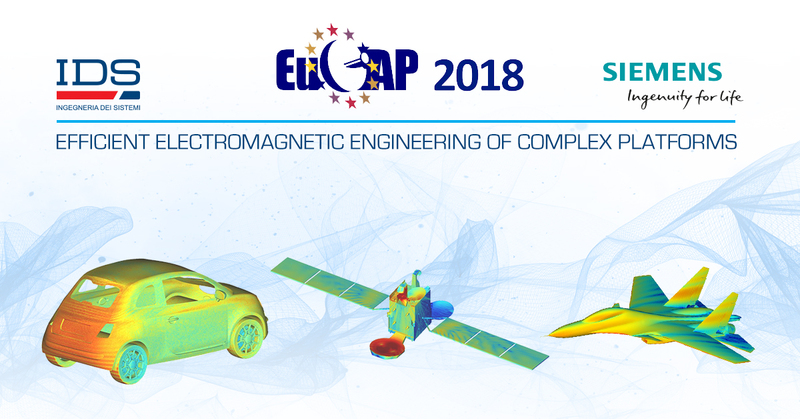 IDS and SIEMENS PLM are pleased to invite you to a workshop “How Simcenter 3D can contribute to the efficient electromagnetic engineering of complex platforms” at the EuCAP 2018, on April 10th from 16:30 – 18:10 in ICC Capital Suite (Room 15). The design and optimization of the electromagnetic performance of real life complex platforms such as aircraft, spacecraft, UAVs, ships, and cars is not simply a matter of solving Maxwell’s equations with an efficient Computer Aided Engineering-CAE tool. It’s a process guided by experience, best practise and knowledge of the problem requiring a perfect synergy between modelling and measurements. Simcenter 3D, the leading multi-physics engineering platform for 3D simulation by SIEMENS PLM Software, adds significant value to the ElectroMagnetic Engineering process. Electromagnetic Engineers dealing with complex EM problems need particular functions to efficiently prepare a CAD geometry for an electromagnetic simulation application. Simcenter 3D embeds a range of exactly these capabilities. Coupling these capabilities with the renowned Galileo CAE capabilities developed through the lengthy IDS experience in electromagnetic engineering and physical testing competences, results in highly efficient workflows, super-fast solutions and provides the required fidelity of simulations. This workshop perfectly matches EuCAP’s mission aimed at providing an overview of the current state-of-the-art in Antenna, Propagation and Measurement topics, highlighting the latest developments and innovations required for future applications. EuCAP is supported by top level world-wide associations on Antennas and Propagation, provides a forum on the major challenges faced by these communities and includes contributions from colleagues from European and non-European industries, universities, research centers and other institutions. For more information on the workshop, please visit us at our stand, Booth 106-206.